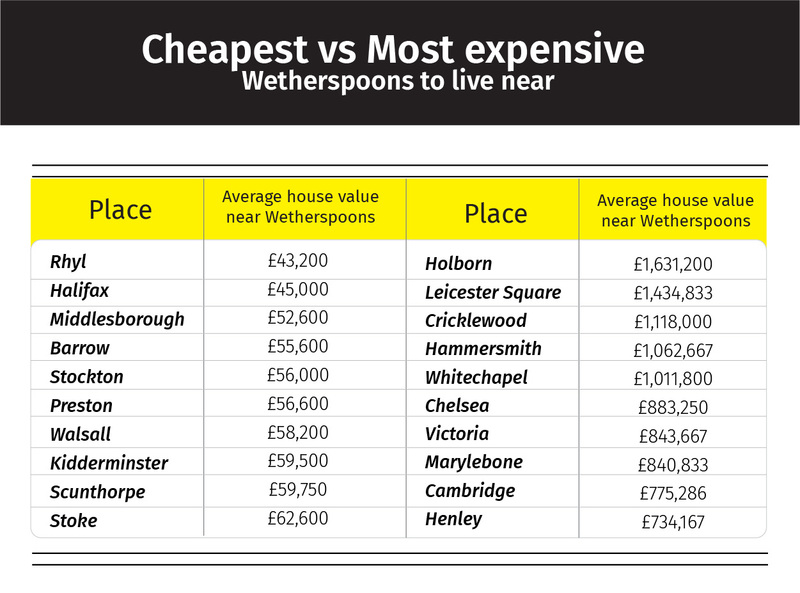 Houses within walking distance of a Wetherspoons sell for 27% less than the local average, we’ve discovered. We've all heard of the Waitrose Effect, which sees property near one of the up-market stores boosted by as much as £36,000 - with this in mind, we wondered if there's any other similar effects that exist in the housing world. We’ve compared the prices of houses sold in the last 12 months within walking distance of a Wetherspoon pub to the average in their area. We’ve also compared the average house prices of properties near a McDonalds, the best rated Pub and the highest rated Restaurant to local averages. Our research found that houses within walking distance of a Wetherspoons were 27% (over £70,000) cheaper than the local average. The effect could be seen in 86% of 184 locations we studied. 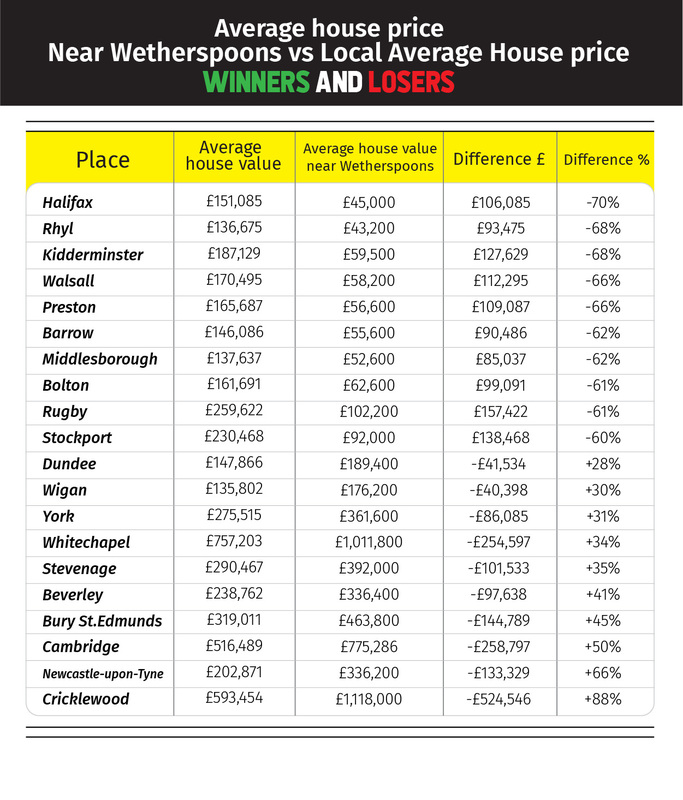 What’s more, houses sold near a Wetherspoons were 50% cheaper than the local average in 28 areas. In 24 locations from our sample, houses near one of the pubs were more expensive than the local average. Many of these locations include affluent inner-city areas, such as Cambridge, Windsor, Edinburgh, and unsurprisingly, many areas of London. What about living near a McDonalds? When comparing the cost of a property within walking distance of a McDonalds, to local averages, we found properties a stone’s throw away from one of the fast food outlets were 25% cheaper. 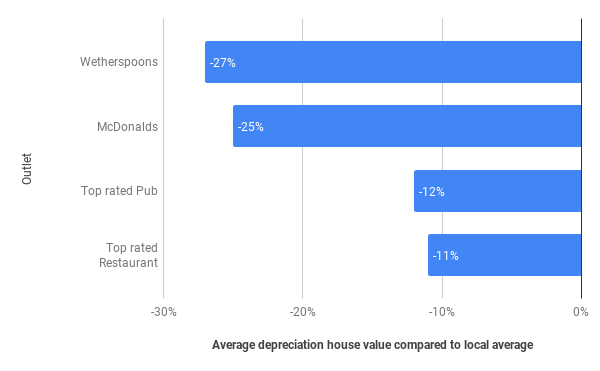 Similarly, to Wetherspoons, house situated within walking distance of a McDonalds were cheaper than the local average in 88% of our sample locations, with 22 areas being cheaper by over 50% of the average local price. Look at the map below to see the 5 areas where houses (within walking distance to McDonalds) are cheapest/most expensive compared to the local average. 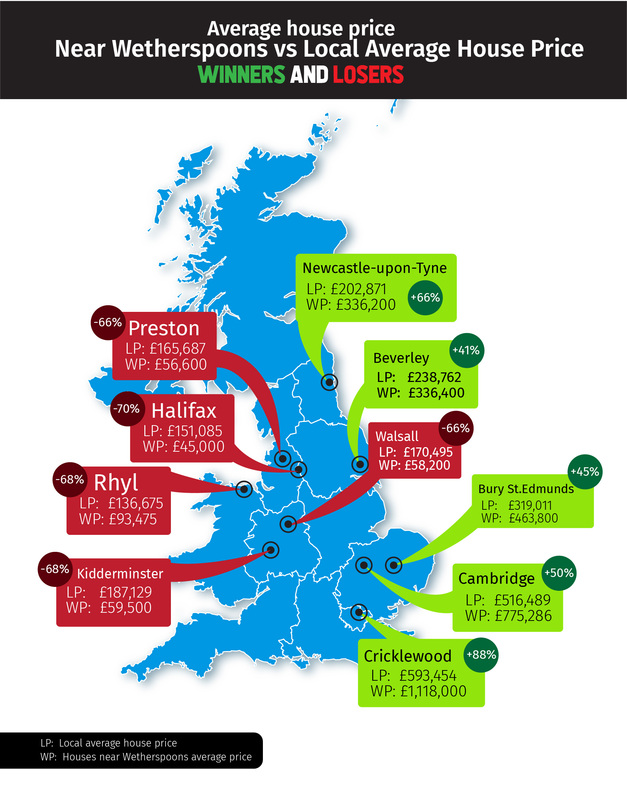 The North again dominates, with 8 of the top 10 cheapest locations by percentage difference. In Halifax, Grimsby and Chelsea the price of houses near McDonalds were all more than 70% cheaper than the local average. 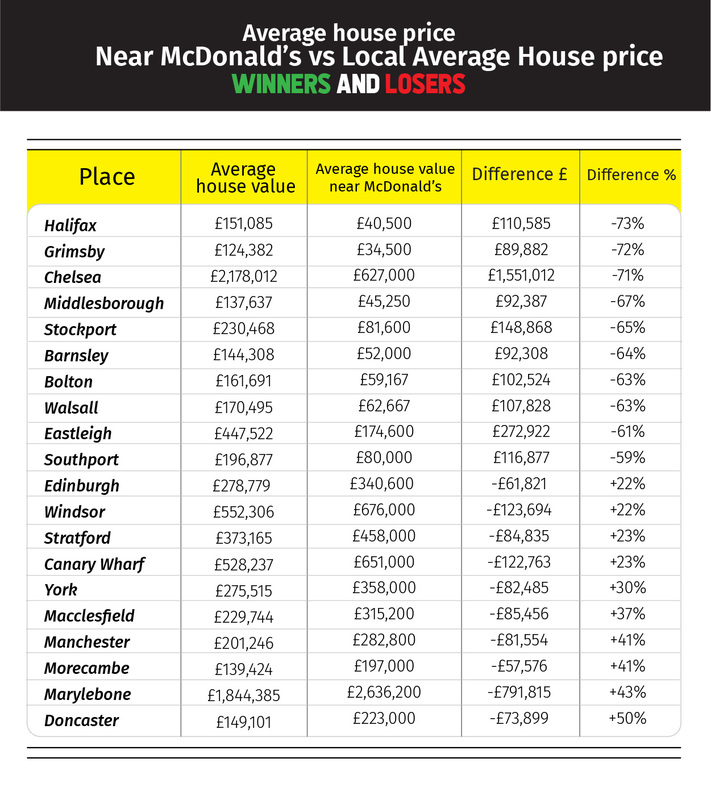 At the other end of the spectrum, houses in Doncaster that were near the Bawtry Road, McDonalds were 50% more expensive than the local average of £149,101. Following the South Yorkshire town, the next most expensive area to live near a McDonalds in comparison to the local price was Marylebone, with the average price of houses sold near McDonalds were 43% than the cities local average. 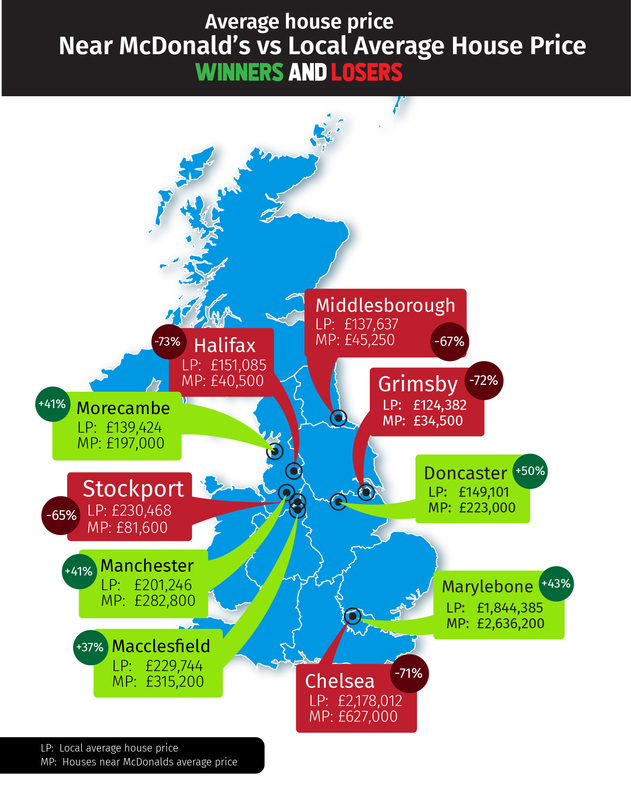 When solely looking at price, properties in Grimsby located near a McDonalds are the cheapest at £34,500, closely followed by Halifax, Middlesbrough, and Burnley - all of which have houses priced at less than £50,000. 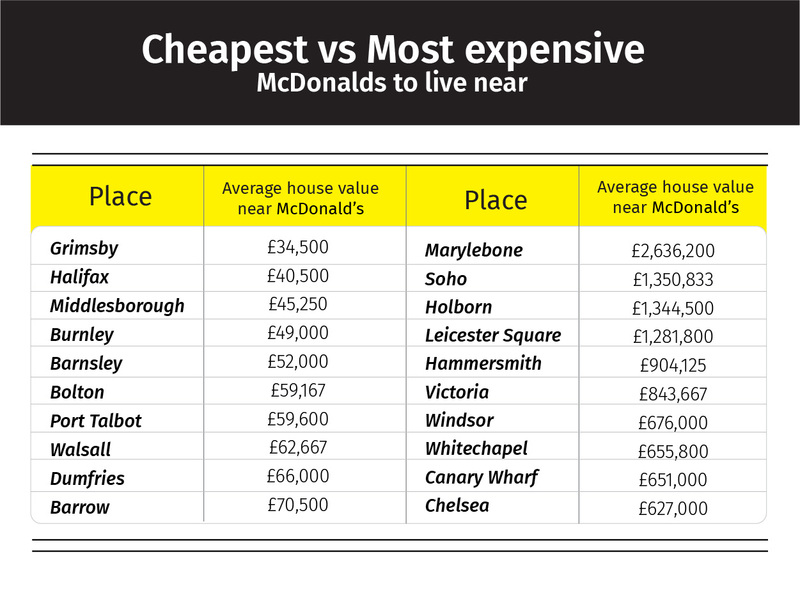 For the most expensive areas to live near a McDonalds, all the top 10 (except for Windsor) are in London, and above the price of £600,000. The average house price near Marylebone McDonalds lead the way at £2.63million. Soho, Holborn, and Leicester Square all follow next, with the average house price near their McDonalds, all coming in above £1.28 million. 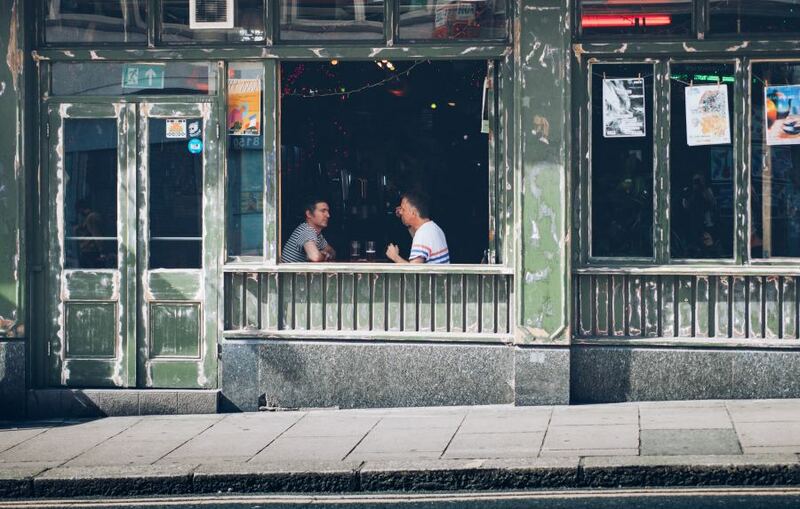 How does living near your town’s best pub/restaurant affect house prices? We found no correlation between house prices and walking distance to one of the best rated (by Google and Trip Advisor Reviews) pub and restaurant. In fact, from our sample, we found that houses located near the best rated pub were 11% cheaper on average than the local price, while restaurants were 12% cheaper than the local average. It’s worth noting that there was an eclectic mix of locations for the best rated trip advisor restaurants. For instance, several of the best rated restaurants were classified as ‘cheap eats’ in the centre of the towns or cities sampled, whereas many others were venues located on the periphery of the locations examined. Want to see how strong the Wetherspoons Effect is in your area? Click here to view our the data and check for yourself.